The streets of Campbell River flew by from behind the metal bars enclosing the back seat of a police car. Shivering in the damp paddling layers I’d been wearing for days, I was only semi-conscious of how haggard I felt. The car came to a stop, the door was opened from the outside, and we were quickly marched through the entrance of a warm, doughnut filled Tim Horton’s. Everyone in the place turned to stare as two official gentlemen escorted a group of kayakers, who looked like they just wrapped up a wrestling match in a thorn bush, up to the counter. Over coffee and Timbits, we recounted the series of events that led to our impromptu Timmy’s dinner date with Ian, a Royal Canadian Mounted Police officer, and Darrel, the head of Campbell River’s Search and Rescue. 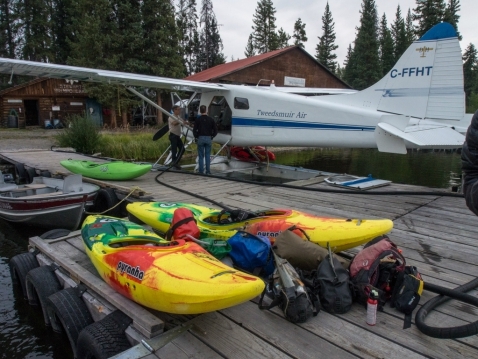 Nine days before, Jo Kemper, Darby McAdams, Jordan Slaughter and I had loaded up a Beaver and Cessna with four kayaks, camping gear and nine days of food. 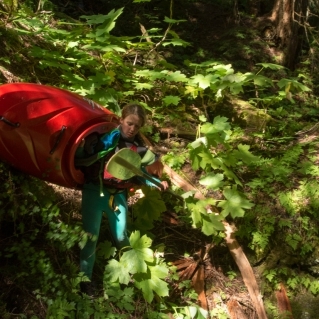 Our goal was to become the first female team—the first team period—to paddle the entire Klinaklini River, which flows from British Columbia’s central plateau, through the Coast Mountains, to Knight Inlet in the Pacific Ocean. Just before the river meets the ocean, it carves through a series of class V gorges, which have never been successfully run. 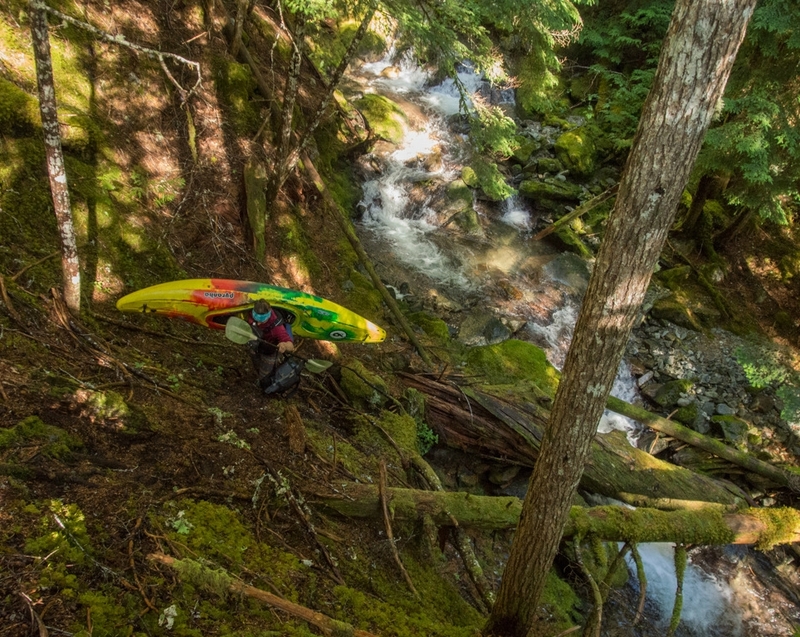 Before laying eyes on this 20-kilometer section during a quick scout flight at the beginning of the trip, all we knew about the whitewater was what we could derive from Google Earth and the scattering of information from the people of previous attempts. 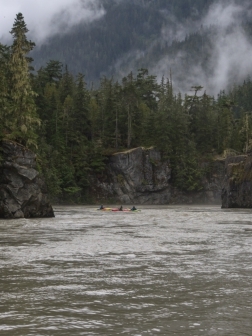 Our extensive research, meticulous planning and late season launch meant the water levels were low and we were confident we could paddle through the canyon and portage some of the bigger, unrunnable rapids at river level if needed. Unfortunately, on our second day right before we dropped into the canyon, we were hit with heavy rain and the river nearly doubled in volume. 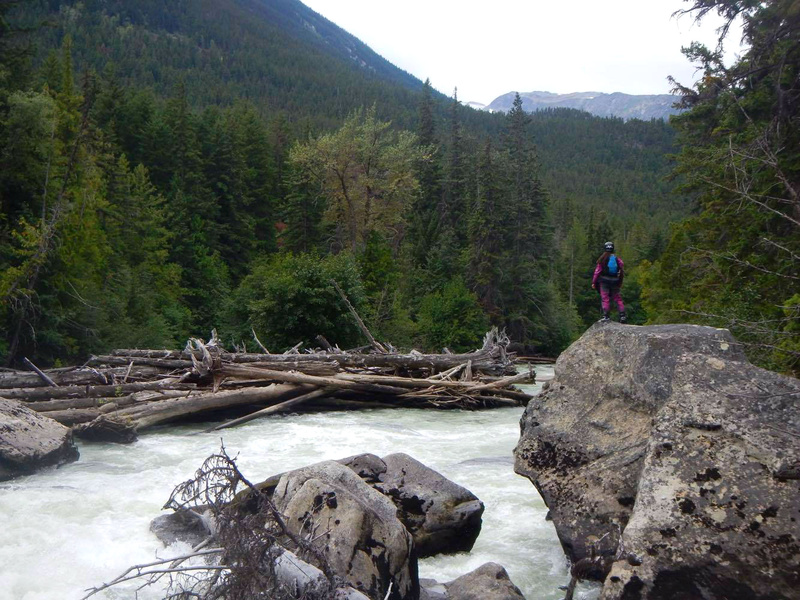 By the time we entered the top gorge, we could already tell the flooded river was pushing the limits of manageable. 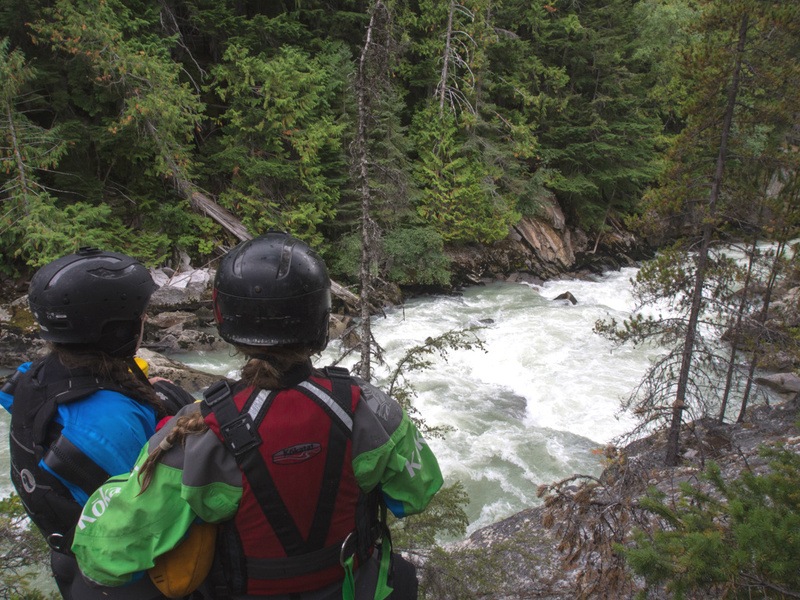 We spent three days scouting and portaging the upper gorges, keeping an eye on the river in hopes it would drop. 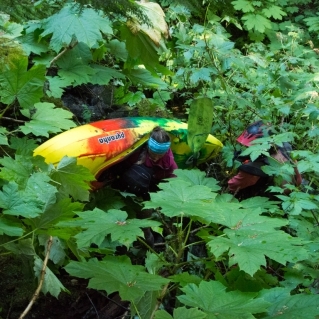 Eventually, we made the hard decision to leave our kayaks and hike out to a logging road, which was the original ‘Plan B’. After a half day of hiking, we made it within throwing distance of the road; however, a steep, raging tributary halted our progress. 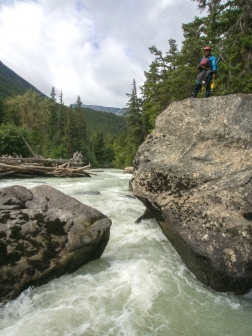 For two days we scouted upstream and downstream for a place to cross, yet the high volume siphon pile never leveled out enough for us to rig a pendulum or even ferry a kayak across. We assessed all our options and assessed them again. We even tried throwing wood into the river to build a small beaver dam. Eventually, we recognized we were trapped by the terrain and running out of time. Day 2: Entering the gorge. Day 3: Portaging steep cliffs dense with Devil’s club. On challenging expeditions, your mindset goes through different phases, especially when constantly faced with difficult decision-making in high-risk environments; it’s easy to forget the bigger picture. 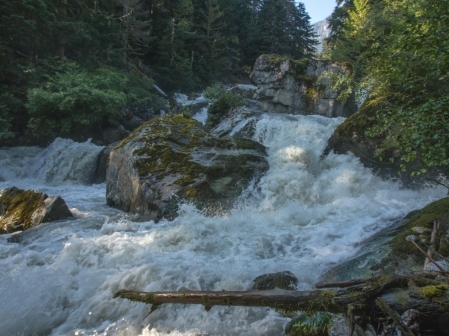 No one can ever really know what it felt like when the four of us sat next to that roaring tributary in silence, watching the silty glacial water rush past, the collective mute saying more than any words could. No amount of social pressure compares to losing a friend. Of that, we knew first-hand. Ian and Daryl voiced their support for our decisions and once the story was told and the coffee drained, they cheerfully asked us what we were going to do now. Considering our car was in Nimpo Lake and we were on Vancouver Island, the adventure was far from over. The original plan was simple—fly from the river mouth via floatplane—so none of us saw any reason to bring any money or our ID’s. I was hesitant to admit this, but they figured it out. Regardless of our predicament, these two men had already gone above and beyond to help us. Plucking us from the Klinaklini via longline was all we anticipated. So we embraced the head shaking and short lecture, and when we were ushered back into the police car we couldn’t believe they were going to not only help us find a hotel but vouch for our situation. We soon found out that, even with the official word of the police and the head of SAR, Campbell River hospitality simply won’t operate on the age-old IOU system. In the end, Daryl invited us to sleep on his floor until we came up with a plan. 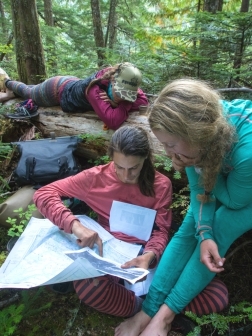 The team consults maps to figure out a plan to hike out. The tributary the team needed to cross for Plan B was raging. Two days, a few bottles of scotch, and many stories later, there was a break in the rain and we left Daryl’s showered and fed for the float plane dock. But, as soon as we arrived the visibility disappeared along with our plan to fly; we were losing patience and needed to get off the island so we re-assessed our options again. By this time, I was able to access the remaining funds from my dwindling Canadian student bank account—about 200 bucks—and Jordan figured out how to use ApplePay. We came up with a plan for Jo and me to fly to Annahim Lake, an airstrip fairly close to the car, and then get a ride from our original float plane pilot Duncan, who kindly offered to help. 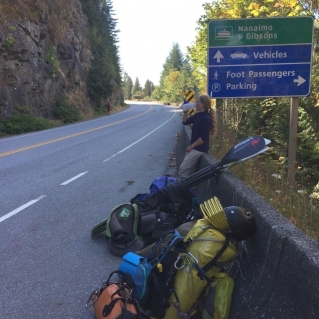 Meanwhile, Jordan and Darby would take a bus to the ferry terminal in Nanimo, cross to the mainland, and hitchhike back to Whistler. Just after all the logistics were organized, two friends returning from the Stikine offered to detour eight hours, fetch our car, and drive it to Whistler. We gratefully accepted, canceled our flights, and headed toward the bus stop as a group. Four girls running down the sidewalk at 7 am carrying paddles, an assortment of multi-colored dry bags and wearing kayaking thermals attracted a lot of stares and soon a subaru pulled over and offered us a ride to the bus. It was a great start to a long day. From there, travel was smooth getting to, and crossing on, the ferry. 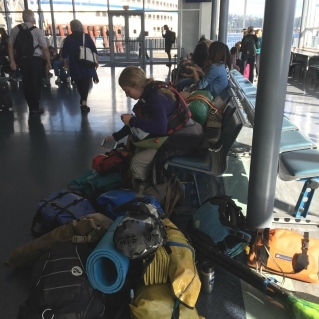 Once back on the mainland, we polished our thumbs, split into two groups and waited. No one stopped. Tired, dirty, and defeated, we found a taxi and made a deal to take us to Whistler, where we met our car the next day. In terms of planning a first descent, we tried to account for everything. We did our research. We considered the ‘what ifs.’ We had the equipment needed for a successful descent and the resources to call for help if something went wrong. What we didn’t consider was if we did call for help, then what. This won’t be my last first descent attempt, and I can almost guarantee it won’t be my last first attempt failure either. The aftermath of trips like this is often not spoken about. In truth, we rarely hear anything or see footage of failed attempts unless something tragic happens. We see the epic successes in all their good (and bad) glory—the big drops, the beat downs, the cheers around a campfire and the shaky go-pro POV after a big swim. But the expeditions that don’t work out get minimal airtime and the ‘failure’ stories are often brushed under the rug in hopes they will be forgotten. 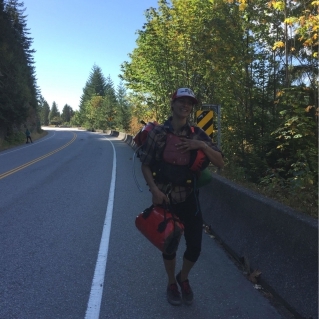 I’ve been both commended and criticized for my positivity, even in the shittiest situations, and up until the very end, I was confident we would problem solve and figure out a way to get ourselves safely to that logging road. The cliche goes, sometimes the right decision is the hardest to make and as the trip leader, that couldn’t ring truer. 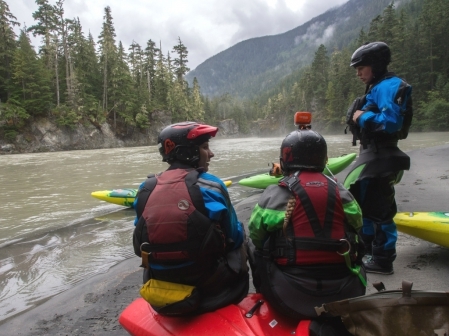 Calling SAR was not an easy decision to make; it meant admitting defeat, it meant saying “I can’t,” but it also meant my team and I would be able to continue exploring rivers in the future. Emerging from and reflecting on this experience, I am mindful of what’s most important. 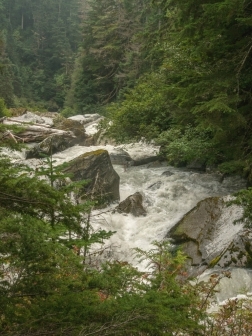 It’s easy to spend hours going over every detail: geeking out looking at gauges and determining how weather effects drainages along the BC coast differently, analyzing the team, second-guessing the timing, the list goes on. In the end though, sometimes things just don’t pan out. In the months after the trip, people reached out to me with similar stories of perceived failure and requiring outside help and my perspective began to shift as the depth of my gratitude expanded. 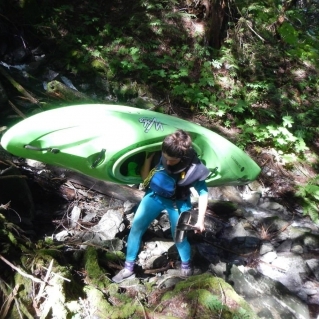 As a kayaker, I learned more about planning expeditions, assembling and leading teams, and coastal BC weather forecasts. More importantly, as a person, this trip showed me the true goodness in others. The generosity and help we received from the entire Campbell River Search and Rescue, Ian, Daryl and his wife, the strangers who picked us up along the way and the friends who went out of their way to get our car, and the fact that no one expected anything in return is something I will remember most from the entire trip. 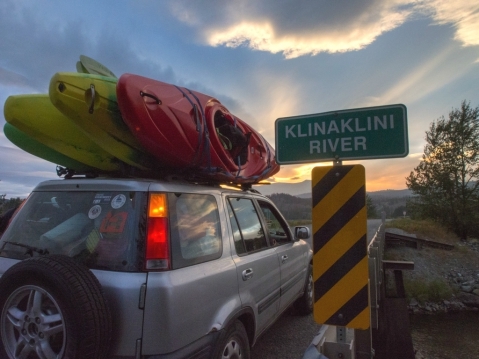 The power of kindness, the people I met, and the relationships I was able to foster far outweigh any drop I have and probably ever will kayak. And for that, I consider this non-descent a success. Editor’s Note: Watch the full three-part video series on this expedition here.